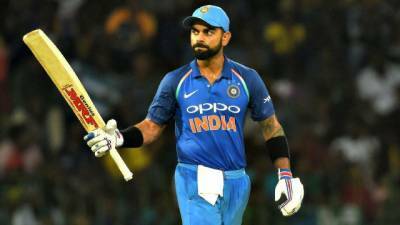 NEW DELHI - Indian skipper Virat Kohli achieved another milestone during the first T20 International against England on Tuesday. Kohli became the fastest to reach 2000 runs in T20 Internationals. He is also the first Indian player to reach the landmark in the shortest format. The Indian captain took 60 matches to reach the milestone. The earlier record was held by Brendon McCullum who had reached 2000 runs in 71 matches. Kohli is the fourth batsmen in the world to scored 2000 runs in T20I format after Martin Guptill (2,271), Brendon McCullum (2,140) and Shoaib Malik (2,039). The Pakistan allrounder reached the landmark on Sunday during the T20I against Zimbabwe. Virat Kohli scored unbeaten 22 runs in 20 balls against England in the first T20I as India beat England by 8 wickets. KL Rahul scored a century after Kuldeep Yadav took a fifer to restrict England to 159/8 in 20 overs.